We’ve got litter box issues in the condo but they’re not mine. TW has litter box issues as in SHE NEVER REMEMBERS TO CLEAN THE BOX! You may remember I did a post a few weeks ago mentioning important facts to know about litter boxes, like they should be cleaned every day. Mine get cleaned twice a day. You may ax what the problem is. The problem is that the first time it gets cleaned isn’t until 4 pm some days! I could be hopping on 2 legs by then. Another topic the post mentioned was that we should get new litter boxes every year or so. I’m here to tell you that one of my boxes is over 10 years old. I LOVED that box but TW got inspired and it’s history! I don’t, however, think that my innerview had anything to do with it except that I had my cousin Fluffbomb as a special guest. condone letting kittehs play with yarn. Aunt Karen sent TW a pic of the new litter box she bought Fluffbomb and his fursibs. TW squeed and oohed and aahed. Once she found out those particular boxes were on sale, her fingers flew fast and furious on the keyboard. She couldn’t swipe the credit card fast enough … but … she needed a minimum for free shipping cos TW never pays shipping costs. She picked out a few toys for me since I didn’t get anything on my Gotcha Day. That still wasn’t enough so she decided to change BOTH of my litter boxes at the same time! GASP! Even the new box that was only 5 years old! TW decided to give my old boxes to A Call 4 Paws but there was a hitch. They’re big with the covers and she had no place to store them until Linda could pick them up. She had to put the covers into the Refuse Room. Oh well. Sometimes the best intentions go awry but at least she got the boxes. The first thing TW did was take the doors off the new boxes. I like privacy but can’t figure out how to push open the door don’t really need a door. TW switched out the new box first to make sure I’d use it. After she made sure I both peed and pooed, she swapped out the other box. I now have two sparkling new litter boxes and TW has been cleaning them before noon. They’re not quite as deep and she wants to make sure I continue to use them. I think I like my new boxes even if I don’t condone kittehs playing with yarn balls. I’m Photoshopped in my new box. TW won’t take a pic of me actually in my box. Don’t know if I like that cat behind me who’s staring at me. There was a slight “oops” moment the second time I used the box in Pop’s bathroom. I’m used to the deep box I used to have and kinda overshot the box. I didn’t actually want to mention this but TW was a real biatch and typed it anyway. She’ll get hers when she least expects it. These boxes were a big hit when I premiered them on Twitter Tuesday night during #Blogpawschat and several humans axed where they could buy them. TW got them at Petco. They’re made by Moderna and if you Google them, you can find them elsewhere. Those are gorgeous looking litter boxes. I'd love one for the feline bosses but cant justify the cost of a new one at present. Still they are on the list for when it is time. My must have product is the CatSmart litter inside the liner. This is not to advertise their product but it takes me about 15 secs to change the litter and I don't have to disinfect the box everytime. It is more costly but it is my absolute must have. Ps. My two feel the same way as you about doors on boxes - no way! Pps. I feel the same about cats and wool but Red reckons he needs to test chew everything I crochet or knit - naughty boy! Very nice designer boxes. I don't think my 3 boys would approve. I clean the boxes once a day, every day except Sundays when I got into work early. The husband gets to clean them that day. We have a huge litter box and a circle box. No covers, we started them without covers and it's been like that ever since. We've never seen such nice litter boxes! We have a number of boxes, but our human finds it hard to find any that are deep enough for Nicki's digging. Even the new hooded ones aren't as deep as our old hooded ones (13 years old, before our time, even). We don't have the hoods on them, don't even know where they are. Thanks for stopping by for purrs for Nicki...We both have been quite sick, actually, but Nicki seems to have been hit worse, perhaps exacerbated by the short stint on Prednisolone (which the vet claims didn't lower his immune system...whatever). And Nicki has chronic coughing issues (asthma/bronchial issues) that are slowing his recovery, we think. So we hope you're right, in that the homeopathic meds will make us sound worse before we get better! 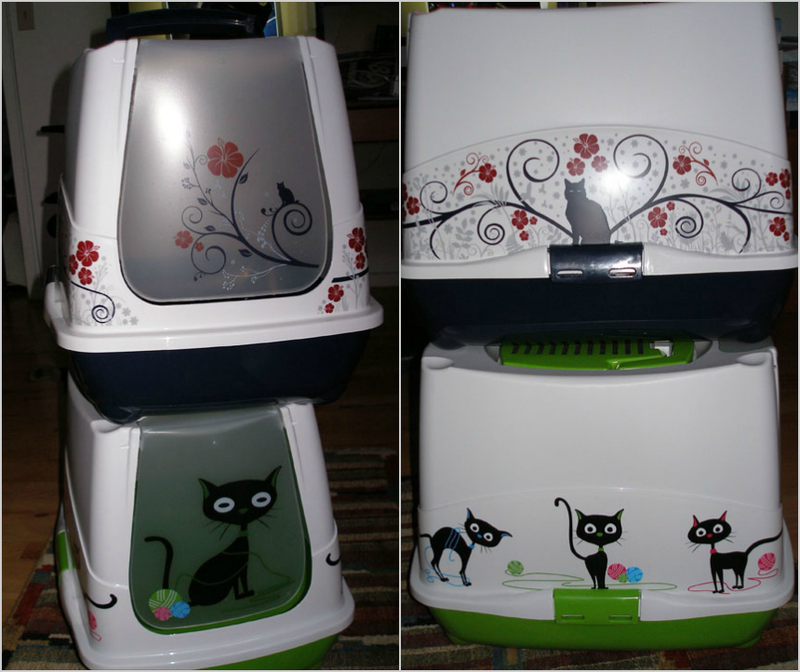 OMC Mommy has gone gaga over those litter boxes for awhile now. She just stares at them when she goes to Petco but hasn't bought me one yet!!! Would you believe I'm using the same litter box as the 2 cats before me!!! Those boxes are right fancy CK! Our peeps have a no pass rule and they never go past a litter box without checking it and scooping it if someone used it. 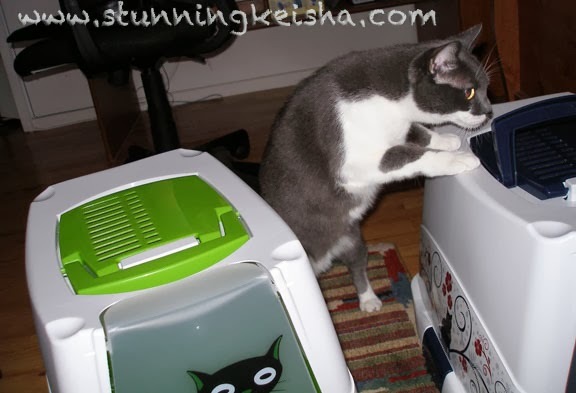 OMC your new litter boxes are so cute! I had no idea Petco carried such pretty box. I gotta check it out! Doors on all our litter boxes are taken away, too. Some don't have lid either. Those are some good-looking litterboxes. We don't have covered boxes, or we would be demanding those, for sure. What cool bathrooms you got, CK! We kinda wish we liked covered boxes so we could get one of those. Those are very cute litter boxes! But my picky human only uses the sifter kind of litter boxes, and she forgoes the lidded variety anyhow because she worries it must smell like an outhouse with a lid on. Really, she overthinks things! Those look cute, and nice and I'd like one but New Zealand is a bit of a backwater and things like that never make it here. Those are some swanky boxes! Every year? Time for new ones! - Crepes. Maybe you could replace the door with a nice window treatment. Those are some good looking boxes! Ooo CK! Those are nice and cute! No wonder TW rushed to buy them. Those are really nice looking litter boxes! Our big litter box upstairs actually belonged to Manny and Heidi, our Angel bunnies whom we've never met. The box is probably about 10 years old now. 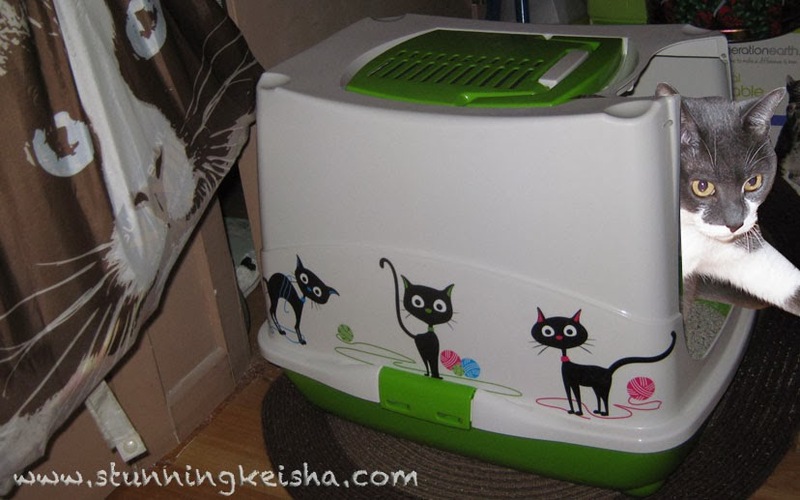 It's not even a proper cat litter box but it works and we love it! We aren't sure about covered litter boxes. Mommy thinks they would probably trap all the humidity and make it very unpleasant for any cat to enter. Very stylish CK. They are well cool. Have a fabulous Friday. We wish you many happy pees and poos in your new boxes! My mom-person is still looking for a big triangular litterbox with a roof for me. Oh Cod!! *slaps paws over mouth* THOSE are like totally wonderful litter boxes!! Mine are just dull, dull...gray...sheesh...but yours are like totally upscale for sure..sigh..must be nice..peeEss luvluvluv your new header and green tinged blog design...very spiffy! Wow!!! Super nice litter boxes!!!! Ours is so plain!! Mary here- Poor CK - you have such a rough life - just like Mario does. Those new litter boxes look pretty fancy there girl. Hopefully you'll use them faithfully. Oh my Darling Goddess! I was not *complaining* about the rain! I was reveling in napping to the sounds of pitter-pattering drops against the window panes. Hurry over--there might be more! Good help is tough to get CK. Love those fancy litterboxes though....mine's your standard issue gray number and Mom is pretty good about keeping it ship-shape. Mostly. Oh my Cod, what cool litter boxes, we are just a bit envious over here! Glad you are liking them, CK! Very flash new litter boxes!! !